46 year old with white deposit in the upper lid and IOP of 28 mm Hg. What do you think is the link? 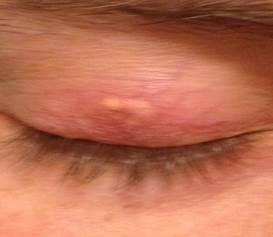 This patient received Kenolog injection into the lid to treat chalazion. The elevated IOP was in response to the steroid injection. Steroid induced elevated IOP is seen in 30-40% of the population in response to exposure to steroids in any form, topical, oral or IV, but only a small percentage will develop clinically significant IOP spike. The type and potency of the steroid agent, the route of administration and the susceptibility of the patient all will decide how soon and how much of an IOP spike one will develop following exposure to steroids. Generally speaking, majority of the pt with POAG develop elevated IOP in response to topical steroid. 40-50% of patients develop IOP spikes following intra virtual injections of steroids as opposed to almost 100% following intravitreal steroid implants. While less than 3% of intra virtual injections of steroids need glaucoma surgery, majority of patients with implants will need surgery to control IOP. Mechanism: This because of increased resistance to outflow pathway in the Trabecular meshwork. One theory suggest that steroids prevent the lysis of WBCs in the TM with the consequent absence of release of lytic enzymes and build up of GAG material leading to increased resistance. The presentation and clinical course is similar to POAG . Watch the Glaucoma lecture series being posted by Dr.Ramesh Ayyala on the Meditred YouTube site.